It was almost 30 years ago to the day that I wrote my first poem, a silly poem in verse, that earned me the praise of my fifth grade teacher, Ms. Schweizer. It was a silly thing, that poem. Full, I’m sure, of silly things, like A-A-B-B rhyme schemes, predictable wording and all the life experiences and sage-like wisdoms of an eleven-year-old prepubescent boy. And so I certainly cannot take credit for what happened to me that day, the day I carried that handwritten poem into class, all loose in my notebook, and probably dangled it out in front of my teacher as if it was something to be proud of. It was her simple praise that granted me the courage to dare believe that someday I’d have a book in print. At the time, it was probably nothing more than some child wishing someday to be an astronaut or a policeman. A fireman or a trash man perhaps. Silly dreams of silly children. And so I certainly cannot take credit for what happened to me that day. It was instead a gift from a teacher I never thanked. Never knew really, till recently, to thank. Only now am I seeing that there was a teacher there every step of the way. Starting, of course, with my mother who first read to me as a child, who gave me the gift of Narnia and Middle Earth and the wrinkles in time. It was my mother who allowed me to curl up in her closet with a flashlight and a book. 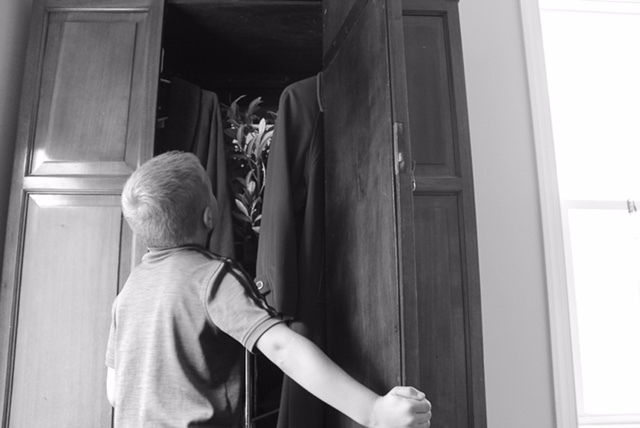 It was my mother who probably caught me peeking countless times as a child into our giant wardrobe in the living room, my mother who allowed her son to go on peeking, to go on hoping, praying, believing that he would find a snowy wood inside. It started with my mother. And my mother would precede my high school teacher, Mrs. Svoboda, who pulled my poems and my stories from the classroom pile and held them into the sky as if I had indeed done a good thing. It was Mrs. Svoboda who affirmed that dream in me. I would go on to college, earn a degree in Creative Writing, where Ms. Leiby took me aside and mentioned the possibility of grad school. It was Sheri Reynolds and Janet Peery who saw something I still wasn’t sure I had, and accepted me for it. It: that thing, that still uncertain thing. And it would be years of being a teacher myself, working with so much of America’s young talent, so much of our next generation of voices. It would be my colleagues who worked beside me. Ms. Miles and Mr. Scapellato, Ms. Hart and Ms. DeTiberus. It would be every one of them, teachers all, who led me by the hand, often unknowingly, often unwittingly, to the fulfillment of a young boy’s dream. I see it as no accident that the original idea for my first blog post about this wild, unimaginable journey kept finding its way back to the teachers who found their own way into my life. On September 25, 2018, I will be a published novelist. But that dream started so many years ago with a boy and his wardrobe, with one teacher after another who had the sight that I did not yet have.